On this date in history, Anne Line was hanged for harboring Catholic priests in Elizabethan England. I am sentenced to die for harbouring a Catholic priest, and so far I am from repenting for having so done, that I wish, with all my soul, that where I have entertained one, I could have entertained a thousand. She’d been disinherited from her Calvinist family for converting to Catholicism, and scratched out a living teaching and embroidering and keeping safe houses for forbidden Catholic clergy. That house was raided in early February of 1601, and while the priest escaped, Anne Line did not. Just one day after conviction, she hanged at Tyburn along with two priests, Roger Filcock and Mark Barkworth. 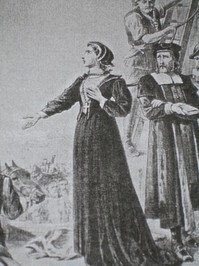 Anne Line was canonized in 1970; she’s one of the Forty Martyrs of England and Wales. One of the possible interpretations (.doc) of Shakespeare’s recondite allegorical poem “The Phoenix and the Turtle” is that it’s about Anne (the phoenix) and her husband Roger Line (the turtledove; he predeceased her).